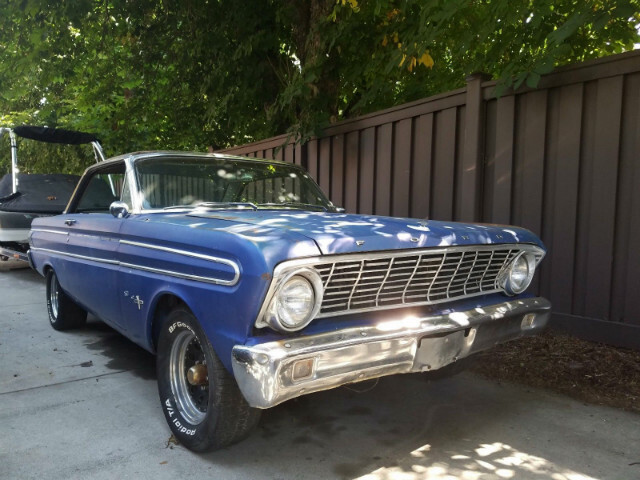 1964 Falcon Sprint 2 Door Hardtop, original 260 V8 4 Speed, original shifter, original interior, a very original, very complete car that needs restoration, or at least some brake work and a few other repairs. Motor runs great, it has an Edelbrock manifold and carb and headers, otherwise stock with original valve covers and air cleaner. It needs a few rust repairs but it is not a rusty car, the worst being the drivers floor pan and some rust from the vynal top. It was origionaly Wimbeldon White with a Factory White Vynal Top and Black Bucket Seat interior, which is an awesome color combination for this car. I have had a number of these Falcon Sprints, and they are getting harder and harder to find that aren’t all molested. This could be a very nice car without spending a ton of money to get it there. It has some extra parts with it like a new dash pad, radio bezel, etc. Priced to sell at $5900. RE : 1964 Ford Falcon Sprint V8 4Spd.